Not on Rodeo Drive, Not at the Castles in Newport, Not DC nor New York. Aspen, Santa Fe and Charleston were all voted out…rather the choice was for Mukwonago to shoot the 18 page center spread for one of the Nation’s finest Bridal magazines! The Greenwald Garden was selected for this magazine spectacular with the theme “The Great Gatsby”. Historically, Premiere Bride Magazine breaks up their center spread at 2 different locations. Ex: last year 9 pages where shot at the gorgeous Leading Hotel of the World,- The Biltmore Hotel in Miami and 9 pages were shot at the contemporary Westin in Hollywood . The year before, the photography was shot in 2 different locations in Puerto Rico, before that Hawaii, etc, etc. This years entire 18 page spread is devoted to this one Mukwonago location. 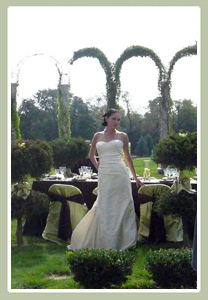 Wedding gown designers have shipped their finest gowns in for this 3 day event. Day 1: Unloading, detailing of the accessories, inventorying, reviewing the staging. Ford Agency model arrives and gets her hair curled….she must sleep carefully so as to retain the pinning. Day 2: Things start early! 3 different photographers are the first to arrive. Shortly after them, the video crew sets up….they flew in from Texas to document this shoot. The Excalibur auto arrives, complete with wedding packages as props. 12 locations in the garden will be photographed today from morning to dusk. Day 3: Bring in noursishment for another full day. New Ford agency models arrive along with the children. Preview every location, remove the overnight leafs off the French granite benches. Manicure the last blade of grass….they start the session. 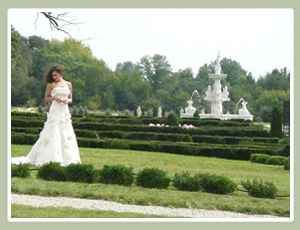 Unbelieveable gowns and furs; revered-top-models; sparkling 25’ tall white marble fountains splash in the sun; the bride leads a stately thoroughbred horse in the field; spectacular table services under a huge oak tree;thoroughly groomed lap-dogs with rhinestone collars compliment the bridal scene under a 20’ wide white marble gazebo; scarlet long-stem roses cascading out of the topiaries; creatively-designed doomed-cakes; fairly-nymphs with custom dyed accessories to fit the children models; bridesmaids strolling on the 80’ long white granite arched-colonnad; and the crew ensuring every detail in the gardens and wedding photography is perfect! By the end of this location shoot, over 2000 photos will have been taken in the Greenwald Gardens for this magazine’s issue.